Software you can bank on™ with the LoanMaker 23a App for professionals in the lending industry. Fast, accurate and a pleasure to use. Works anywhere (no internet connection required) - you can solve your customers' needs on the spot. Instant calculations, odd days, credit insurance (optional), full Regulation Z and SCRA disclosures, dealer reserve. Built on the same code as our popular LoanMaker 623a and i23a WebService Calculators that have calculated millions of loans. Runs on iPhones and iPads. Runs anywhere - does not need an internet connection. Detailed help and instructions on all input fields is available in the App. Virtually no maintenance costs - program updates are distributed directly to your iPhone or iPad via the App Store. Fast, accurate & reliable installment loan calculations with odd days, credit insurance, and prepaid fees. Performs the SCRA Interest Rate calculations required by the Servicemembers Civil Relief Act (SCRA) for borrowers in active military service. Generates full Regulation Z disclosures which can be sent by email, message or to other apps directly from your iPhone or iPad. Accurate for loans up to $10,000,000,000.00 and 40 years - calculations are performed to 16 significant digits. Dealer reserve (participation) and buydown calculations. Qualifies as a Reg Z calculation tool. See below for detailed specifications. The LoanMaker 23a App provides fast, accurate, and fully-featured installment loan calculations to any user with an iPhone or iPad. The LoanMaker 23a App uses formulas and algorithms that have been in use for over 30 years -- you can count on the same reliable and correct calculations that you have received from other PROM Software products over the years. Moving these calculations to an iOS-based platform is the next logical step in providing our services to the financial and insurance industries. 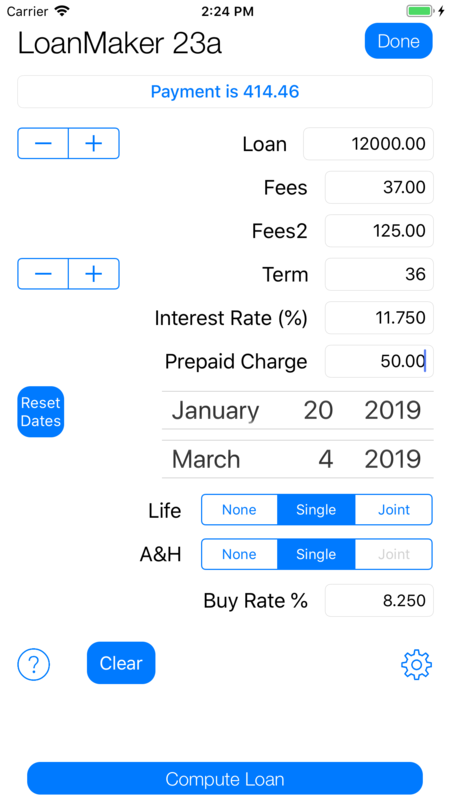 If you enable Dealer Reserve calculations and specify a 'buy rate' (the lender retention rate), the LoanMaker 23a App will calculate the dealer reserve. If the buy rate is greater than the loan interest rate, the dealer buydown payment will be calculated (the amount the dealer has to remit to the lender in order for the lender to maintain their desired return). There are benefits to an institution under Regulation Z when they use a calculation tool both from the perspective of disclosure violations and of meeting the requirement to use an alternate tool to verify calculations. "An error in disclosure of the annual percentage rate or finance charge shall not, in itself, be considered a violation of this regulation if: (1) The error resulted from a corresponding error in a calculation tool used in good faith by the creditor; and (2) upon discovery of the error, the creditor promptly discontinues use of that calculation tool for disclosure purposes and notifies the Board in writing of the error in the calculation tool." "When a financial institution claims a calculation tool was used in good faith, the financial institution assumes a reasonable degree of responsibility for ensuring that the tool in question provides the accuracy required by the regulation. For example, the financial institution might verify the results obtained using the tool by comparing those results to the figures obtained by using another calculation tool." Computes installment loans with optional single-premium (net or gross) credit life and accident-&-health (also called disability) insurance. Interest can be calculated by any of three interest calendar systems: Actual/365, Actual-to-first-payment, and the Federal Calendar. All interest calculations are done by the U.S. Rule (United States Escrow Rule) which makes sure that no compounding of interest (interest-on-interest) occurs during the loan. The computed monthly payment can be rounded to the nearest whole cent or truncated to the lower whole cent. In consumer lending, it is common to truncate the payment. If the payment is rounded to the nearest whole cent, it can increase the finance charge by several cents or more -- and it is possible that the effective interest rate could be greater than the stated loan rate. Truncating the payment prevents this. Default is to truncate the payment. Credit life and A&H (Disability) insurance can be calculated by numerous methods as required by individual State insurance regulators (including net payoff and gross coverage). Provisions are included for single and joint coverage, maximum benefit limits, and maximum term limits. Credit disability (accident-&-health) insurance is available with single and joint coverage. Provisions are included for both a maximum total benefit and a maximum monthly benefit (the lower of the two applies). Maximum term limits also apply. The full details of a credit insurance program is included in a Plan. There are many plans already built into the App, and custom plans can be added. If you already use calculation tool by PROM Software, you already have a plan. If your insurance program changes significantly (something more complex than just rate changes), we can create a new plan for you. Filing fees (fees paid to public officials) are available -- these fees are added to the loan amount and become part of the amount financed. Fees2: Because fees for premium-like products (extended warranties, etc.) affect the SCRA Military A.P.R. calculations, they need to be put in this separate Fees2 field. Prepaid Finance Charges (prepaid finance charges) are available. The fee is deducted from the loan amount and becomes part of the finance charge which affects the Annual Percentage Rate and SCRA Interest Rate calculations. Loans up to $10,000,000,000 and more can be accurately calculated. The formulas and algorithms have been used for more than 30 years, and have calculated millions of loans. The LoanMaker 23a App is written in a high-level compiled language (over 10,000 lines of C++) which maintains a very high degree of accuracy and precision to 16 significant digits.